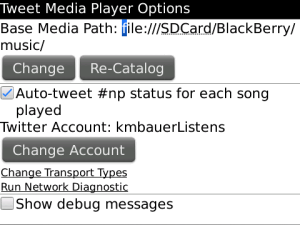 Tweet Media Player is a BlackBerry media player application that allows you to socialize what you are listening to through Twitter. Link the Tweet Media Player with a Twitter account. This can be your primary Twitter account or a new now listening account for just your now playing status updates. From the Tweet Media Player app you can automatically or manually post now playing status updates to you Twitter time line. You can also link your music tracks with your favorite artist twitter handles and give the artists Twitter mentions while you listen to their music. For more info and to see what is now playing on Tweet Media Players check us out at http://bbtweet.com. Intelligent MultiFunc Stopwatch for BlackBerry PlayBook allows you to count time and record lap times.